I will show one of the jewells of the crown! Original: "Caveman Ninja Control Panel Overlay" (Joe and Mac CPO) from DATA EAST property of Mikonos & Zona Arcade (photo 1). Original: "Caveman Ninja Control Panel Overlay" (Joe and Mac CPO) from DATA EAST property of Mikonos & Zona Arcade (photo 2). "New Net City Insert Coin Perfect Reproduction" printed in chrome vinyl with extra gloss protective lamination and precut (photo 1). "New Net City Insert Coin Perfect Reproduction" printed in chrome vinyl with extra gloss protective lamination and precut (photo 2). "Tekken Tag Tornament CPO" restored for Zona Arcade. By Mikonos. Details in "Tekken Tag Tornament Control Panel Overlay" restored for Zona Arcade. By Mikonos. Arcade Artwork “Street Fighter Control Panel Overlay”. Restored by Mikonos & Zona Arcade. Details in “Street Fighter CPO” restoration. Restored by Mikonos & Zona Arcade. "Tail Gunner Side Art Right" (Cinematronics) restored By Mikonos and Zona Arcade. Comparative in restoration of "Tail Gunner Side Art Right" (Cinematronics). By Mikonos and Zona Arcade. Do you do this full time or only in spare time? In spare time along last 11 years! Arcade artwork "Tail Gunner Left Side Art" (Cinematronics). Restored by Mikonos & Zona Arcade. "Street Fighter Control Panel Overlay" printed in vinyl with sand protective lamination (photo 1). "Street Fighter CPO" printed in vinyl with sand protective lamination (photo 2). "Tekken Tag Tournament CPO" printed in vinyl with rought protective lamination (photo 1). "Tekken Tag Tournament Control Panel Overlay" printed in vinyl with rought protective lamination (photo 2). "Tail Gunner Right Side Art" printed in vinyl with gloss protective lamination and precut (photo 1). "Tail Gunner Left Side Art" printed in vinyl with gloss protective lamination and precut (photo 2). "Tail Gunner Left Side Art" printed in vinyl with gloss protective lamination and precut (photo 1). Picture of an original "Puyo Pop Fever Marquee" (SEGA) property of Zona Arcade. Original "Puyo Pop Fever Marquee" (SEGA) property of Zona Arcade. 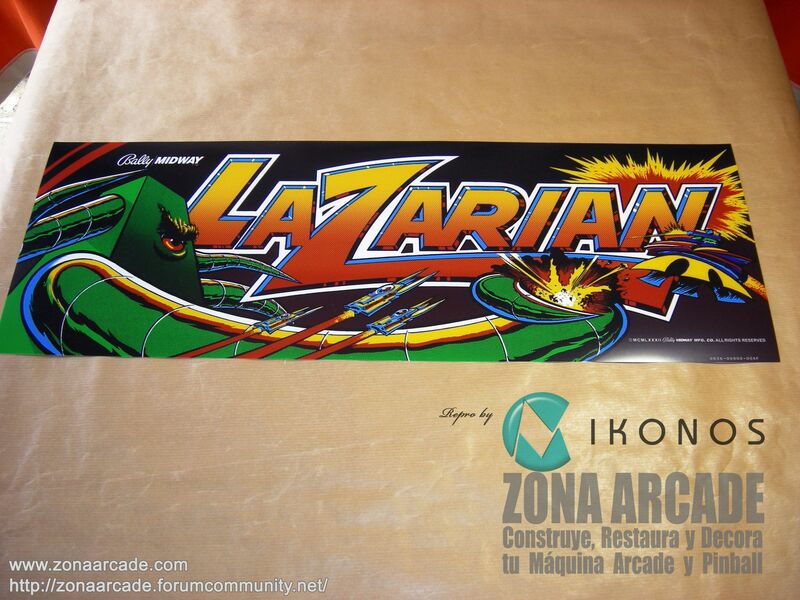 Arte arcade "Lazarian Marquee" (Bally / Midway) restaurado por Mikonos. Aquí algunos ejemplos del estado original de "Lazarian Marquee" antes y después de la restauración. 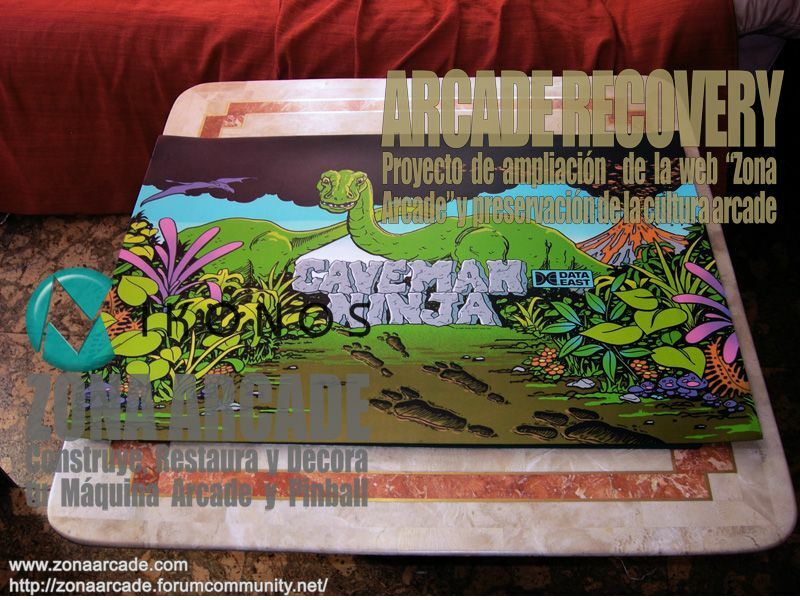 Arcade artwork "Lazarian Marquee" printed in backlite HQ (photo 1). 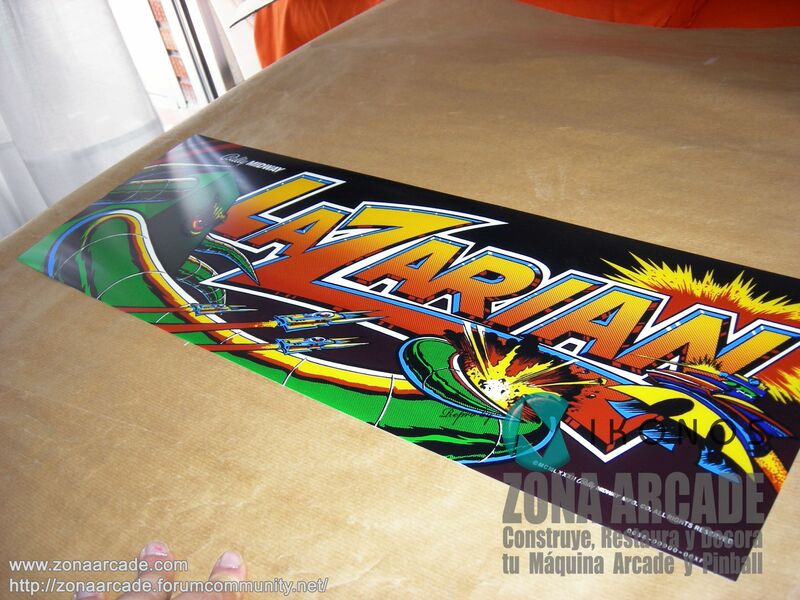 Arcade artwork "Lazarian Marquee" printed in backlite HQ (photo 2). This thread is like a hideo kojima game! I take it as a blandishment! 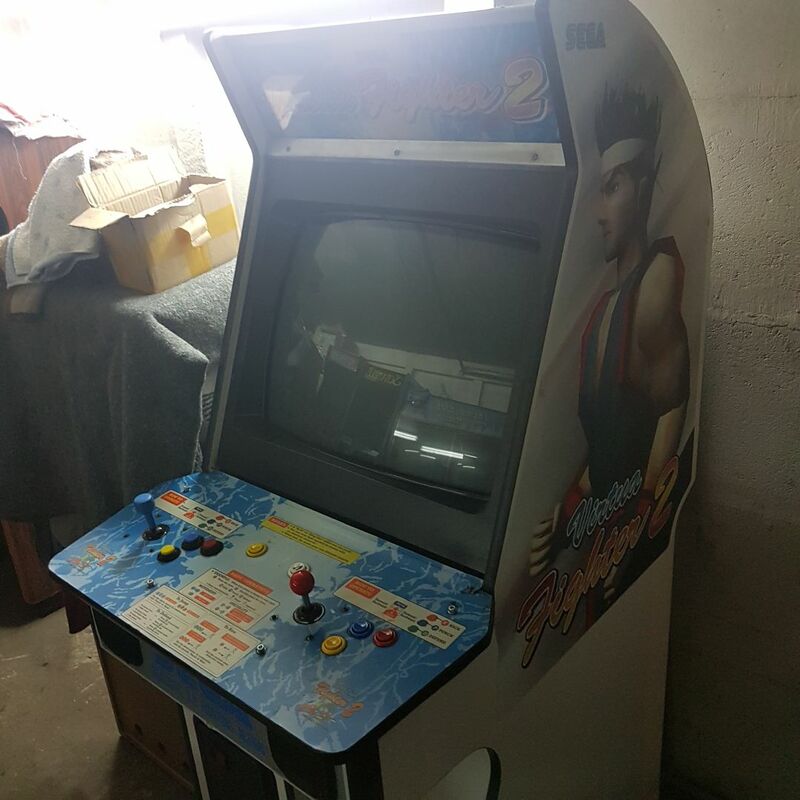 I recently bought a Virtua Fighter 2 Cabinet, but the Bezel was completely missing. I am looking for Artwork to restore the machine and add it to my little private collection. Do you by chance have it? Yes, I have it, but unrestored. I have no problem to restore it for you. Virtua Fighter 2 Bezel. In retoration. Show me your cabinet, please! That would be awesome - thank you very much.